You are here: Home / Local Lake Wylie Info / How Far is Fort Mill or Tega Cay From Charlotte? How Far is Fort Mill or Tega Cay From Charlotte? I see many inquiries coming into Carmen’s blog asking for the distance between Charlotte North Carolina and Fort Mill South Carolina. As you may have read in Carmen’s market research posts (Fort Mill SC Rank 6 Out Of Ten Fastest Growing Metros), the Fort Mill and Tega Cay area is part of the Charlotte NC MSA (metropolitan statistical area) for census and other analysis basis. I guess you could say Fort Mill and Tega Cay are close enough to be considered suburbs of Charlotte. So here are the distance and drive time facts related to the distance between Charlotte and Fort Mill. 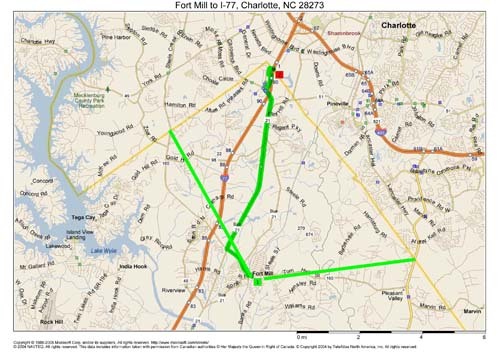 Fort Mill is located south of Charlotte of interstate 77. The North Carolina and South Carolina northern border on interstate 77 is 7.8 miles or 15 minutes drive time from downtown Fort Mill. The western NC/SC border on Highway 160 is 6 miles or 8 minutes drive time to downtown Fort Mill. The eastern NC/SC border to highway 521 is 6.6 miles or 11 minutes drive time to downtown Fort Mill. Tega Cay is located 6.2 miles or 11 minutes drive time from downtown Fort Mill. Downtown Charlotte to Tega Cay or Fort Mill is approx 18.9 miles or 23 minutes drive time. If you live in Tega Cay or Fort Mill and work in south Charlotte near Westinghouse and Interstate 77 the distance is 8 miles and 11 minutes Drive time. Headed further south on Interstate 77 is Rock Hill South Carolina which is 6 miles and 8 minutes drive time from downtown Fort Mill. 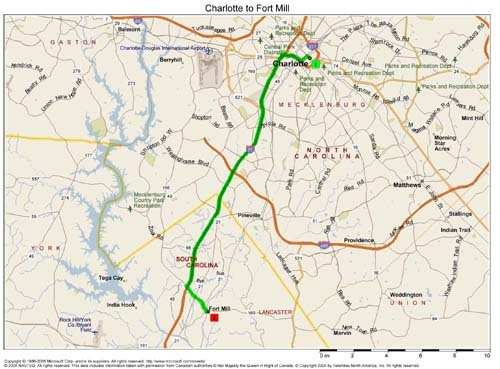 If you take business highway 21 it is approx 4 miles to Rock Hill from Fort Mill. There is a real benefit living in a smaller town like Fort Mill or Tega Cay (especially on Lake Wylie)(read top-10-reasons-to-live-in-fort-mill-sc) but when you want the larger city amenities like; work, shopping, sports (Panthers, Bobcats, Checkers) , restaurants, and other fun (Carolwinds Amusement Park), its nice to have Charlotte nearby. Real estate, Producer of Talk of the Town Carolinas, blogging, apple-holic, Tech dude, Husband to super Realtor @carmenmiller, Dad..Love living in Tega Cay SC, Lake Wylie area. Twitter handle @scottdmiller. Great article about the beautiful parks that our city has! But, did you know that Charlotte also has an abundance of gorgeous nature preserves and greenways? Many of which number thousands of acres! Check many of them out on my site!